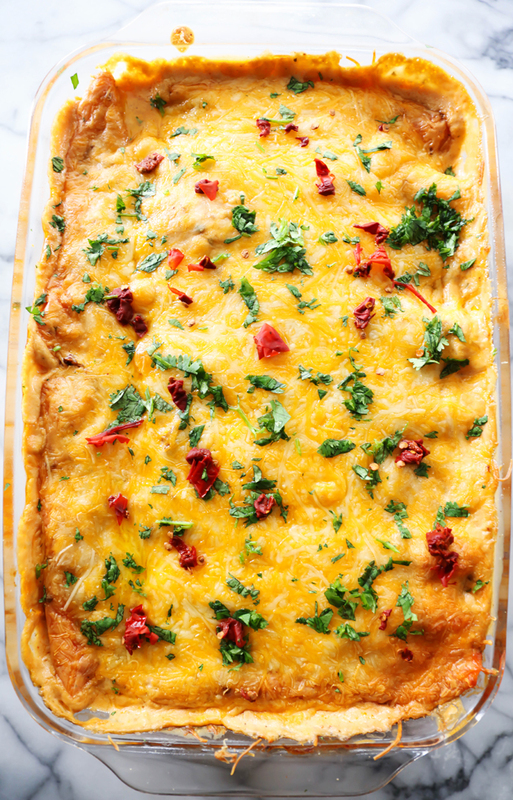 These Creamy Chipotle Ranch Enchiladas are out of this world! They have a kick of heat and a splash of cool ranch. These will become an instant family favorite! Life is getting crazy as we are nearing the start of school. There is SO much to do and get ready for before it starts. 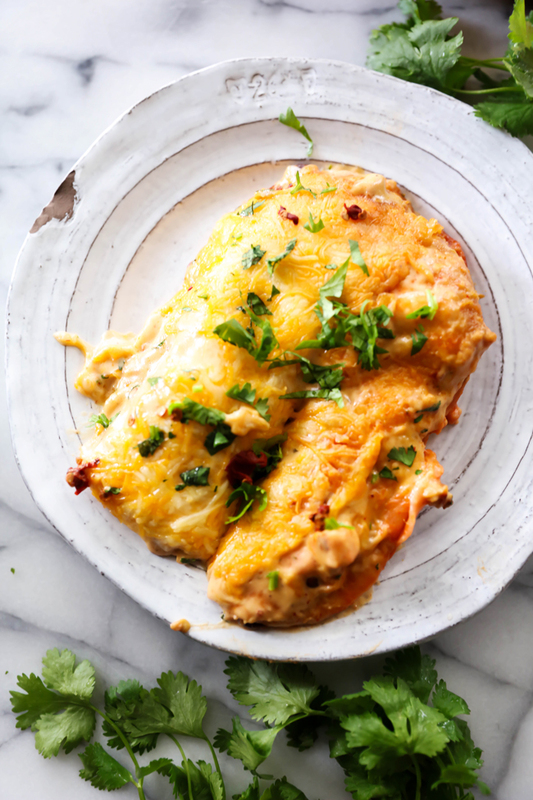 My usual go-to dinner on busy days are my Creamy Cheesy Chicken Enchiladas. They are super simple and delicious. Plus, enchiladas are a meal I can count on every single one of my family members loving and gobbling up. Lately I have had the Chipotle Ranch flavor combination on my mind. It is such an INCREDIBLE combo! 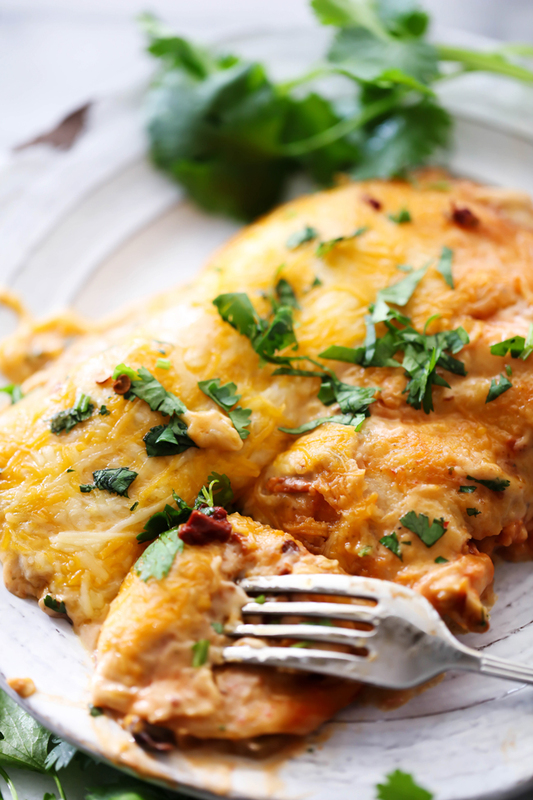 If you haven’t yet, I highly recommend trying my Chipotle Ranch Chicken! It is one of my favorite Chicken recipes on the blog. But let’s talk about today’s recipe. This sauce is to die for! It was such a tasty dinner and has the perfect kick of heat that is cooled down with ranch. Give this dinner a try! You will not regret it! In a large mixing bowl combine chicken, salsa, corn, 1 cup of the and black beans. Set aside. In a large sauce pan or skillet, melt butter and add flour and cook for 1 minute. Gradually stir in the cream and milk. Stir until smooth. Bring to a boil and then add the chipotles, the crushed bullion cube and ranch dressing mix. Cook for 2 minutes on low stirring constantly. Warm the tortillas in a the microwave for 45 seconds. Pour enchilada sauce in a flat dish that you will be able to dip the toritllas in. Dip each tortilla in enchilada sauce then place approximately 3 to 4 Tablespoons of filling mixture on the tortilla and roll up and place in the baking dish. Repeat until the filling is gone. Pour the sauce over the top of the enchiladas and sprinkle the cheese over the sauce. Cook in the oven for 35-45 minutes until sauce is warm and bubbly. They look so good! I would always choose them instead of a restaurant made meal! Did you make them and how did they turn out? Could I use corn tortillas instead of the flour? I like the texture better.